I've been thinking a lot about pirate owls lately. I have another story kicking around in my head that includes this sort of character. 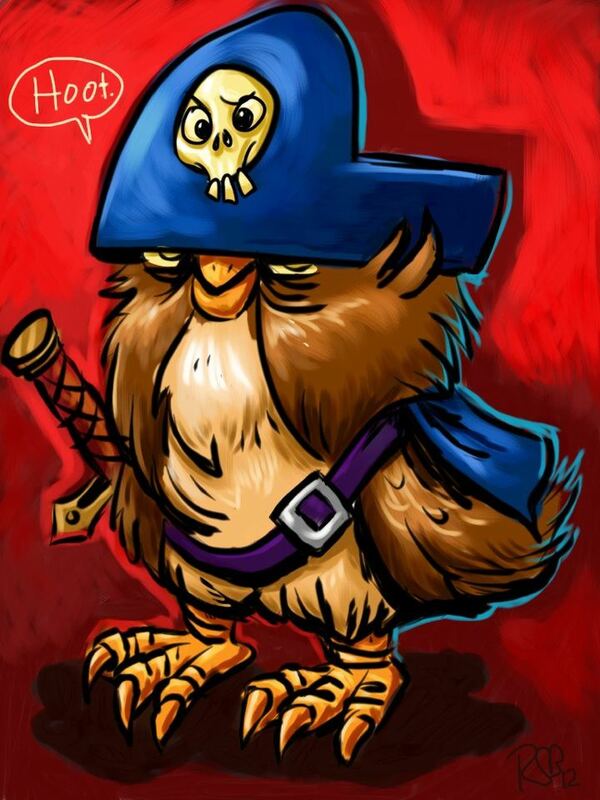 At any rate here's a sketch that I did today in Sketchbook Pro on my iPad. I've been trying to make better use of my iPad lately and have had a lot of fun sketching on it with the new Wacom Bamboo stylus. It's not completely intuitive but I'm getting better with it! I have lots of little scribbles and stuff that I could post but I figure no one really wants to see that mess. But I would like to start creating a regular posting schedule. And I'm trying to hash out exactly what I want to do with my personal work. I'm really looking forward to seeing how things progress this year and have some interesting project ideas on the horizon! I haven't had as much time to sketch as one would really like but I'm hoping to dig in more in the next week. The major distraction (besides continuing to get settled in Chicago) is that I've decided to take on a bit of contract work on top of normal full time job. Since we've got a little one on the way and lots of new expenses coming up I figured it'd be nice to have a bit of extra cash on hand. Recently Australian mobile developer, Defiant Development, approached me about doing some icons for their upcoming iOS and Android game, Heroes Call. It's a really cool looking App that looks like something I'd even be really interested in playing! The game is a fantasy action RPG and sort of has a dungeon crawler-y feel to it. I'm pretty picky about what sort of contact work I pick up on the side but this just seemed to be right up my alley. I haven't worked on a fantasy video game for a couple years now and it's been even longer since I've designed icons for such a game. But the icons I did for Simutronic's now defunct MMORPG, Hero's Journey, have always sat in my portfolio for several years generating interest. If there's one thing I've learned during my career as a professional artist it's that if you can generate UI (user interface) assets, you will find that you have value to a company. I get emails nearly weekly from people looking for me to create icons for them. I don't get nearly as many requested for illustrations or concept work. Unemployment doesn't scare me nearly as much as it used to because all of these people seem to need icons all the time! If you can do it then I'd strongly encourage you to put some interface work in your portfolio. Not all illustrators have the greatest design sense but if you're looking for a gig in the industry this skill set could be the thing that gives you the leg up on your competition. So that's the reason I wanted to post those. I doubt many of you will care too much about the icon work I've done. It's not something I used to take much pride in but I've learned that my skills in this area is invaluable. And it's really been to my advantage to play to those strengths from time to time. Anyway, hopefully next post will be more sketchy! I was just thinking about this subject as I was painting these little buggers and thought it might be something other artists might like to know! One other thing before I bolt off into the night. I have ORIGINAL ART up for sale on my store now if you're interested! 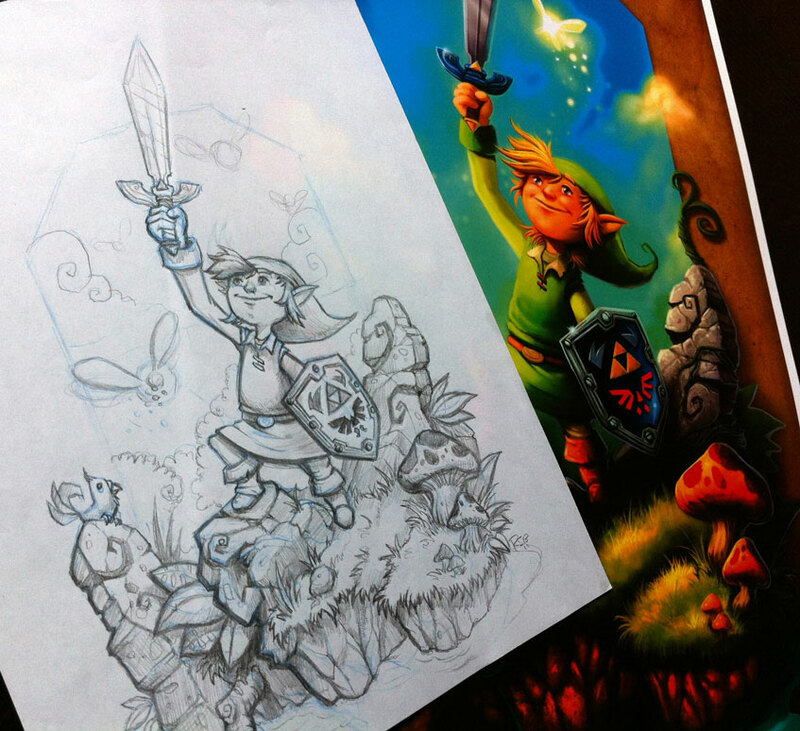 You can pick up a Ninja Turtle sketch, Samurai Frog sketch or even the pencils from my Legend of Zelda illustration! Head over to my shop by clicking here! Thanks for stopping by and for supporting my work! Take care! St. Louis, MO: I'm heading back down to my hometown this weekend to visit with some family and friends! Looking forward to some Imo's pizza during my visit! Ha! Prometheus: Cannot wait for this movie. I'm so hyped for this thing.